#3. What Usually Happens after the Igba Nkwu ? At the end of the ‘igba nkwu’ ceremony, the groom is expected to take his wife home with him. In the olden days, the ‘igba nkwu’ was the only wedding ceremony of the Ndigbo, but these days most Ndigbo couples have church wedding (aka white wedding) after their ‘igba nkwu’. Depending on your (groom’s) preference, the couple may want to have a church solemnization (white wedding) immediatelyy or a day after the ‘igba nkwu’/ igbo traditional wedding or they can choose to have it after a few weeks or months. Of all the above stages of the igbo engagement ceremony, the ‘igba nkwu’ is the one that most brides look forward to, because it is a day for the damsel to dress up like a princess. The bride’s igba nkwu attire is usually a george design double-wrapper and a gorgeous igbo-style lace blouse or the igbo traditional maiden wear (small piece of wrapper on the chest and waist), coral or statement beads necklace and a matching Ichafu head-tie. The groom is not left out of this dress-up thing, his dons a well tailored traditional wear which its fabric and colours compliments his wife’s; he also wears a long coral bead, and a hat (optional) – the igbo traditional attire for men/ grooms is a special tunic top tailored with a special fabric called ‘isi agu’ (isi-agu is an igbo name for ‘head of lion’ – because the fabric is printed with pictures of heads of lions) worn over a pair of trousers, a red cap or black hat, and a fashion walking stick. What would your close friends wear to your igba nkwu ceremony? Close friends and family of the bride and groom would wear a uniform attire (popularly known as ‘aso ebi’ by Nigerians). #5. Who Cooks During the Groom’s Visits? I always get asked ‘who cooks during the marriage introduction and igba nkwu: the bride or groom’s family?’. The bride’s family is the host during the marriage introduction and igba nkwu, and so is responsible for catering for the bride’s suitor and his family, during all their visits. However, where the bride’s family is not wealthy, the groom (unofficially) provides her with the money which her parents would use to host his family – helps to keep away any bad taste. The “Igba Nkwu” party reception costs much because the guest list is simply “everyone” in the bride’s village, plus the groom’s entourage. The main cause of the high cost of having an Igba Nkwu is the cost of feeding the large guests. Usually, the venue is not rented – the bride’s father’s compound. On a lighter mood, here’s one music you definitely should play on your ‘Igba Nkwu’ day (Nigeria’s Flavour in his “Ada Ada’ musical video). I like this Nigerian wedding song because the story-line in the video gives a good illustration of the igbo igba nkwu ceremony. 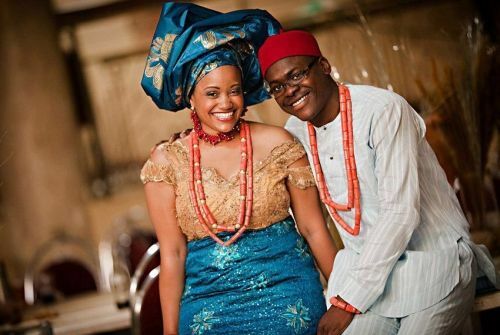 This post concludes our series on the igbo traditional marriage customs and tradition. If you read from part 1 to part 4, you should now have a good idea of how to go about preparing to marry an igbo bride – you first propose to her, then you ask for her parents consent, and finally you ask for her extended family’s consent. And you also know that most of the process is customary and symbolic. Once the parties involved give you their consent, you also know the rest of the ibo traditional marriage preparatory stages – the bride price settlement (ime ego) and the formal traditional engagement and wedding party (igba nkwu). Part 3 – see part 3 here. NOTE: We love nigerian traditional weddings and would be thrilled for you to send us your ‘igba nkwu’ pictures to publish here on NaijaGlamWedding blog. *If you enjoyed reading, please help us share this post with your friends on Twitter/ Facebook/ by email and everywhere. Now, tell me – if you’ve already completed the traditional marriage rites to marry an ibo lady, is there anything we missed in the above guide? And, if you’re preparing to go for the igbo introduction visit to your future in-laws, has this article helped you in any way? Please how many times an Igbo bride changes her dress during her traditional wedding day when she’s getting married to a non Igbo guy? There’s no rule about that. Some people do 2 outfit changes during their traditional wedding. Some do only one change and some change into 3 outfits. Generally, it depends on how many dresses you can afford to sew for your wedding. Hello Mary, I don’t understand your question. But let me see – did you mean ‘after the traditional wedding is completed?’. No, marriage certificate is not issued after the traditional wedding. While the Nigerian traditional wedding is recognized by the Government, it’s a family-organized and community-officiated ceremony, that is why. Couples who want marriage license after a traditional wedding could apply at the customary courts – I think there’s a provision for that. Otherwise, most Nigerians do not do traditional weddings in isolation – they also do either the court registry wedding and/ or the Church (white) wedding, both of which offer marriage certificates right away. Hope I answered your question? If not, please re-phrase? DO YOU RECEIVE ANY CERTIFICATE OF MARRAGE AFTER THE Igbo MARRAGE IS COMPLETE ? Hello Mary, I just answered your question, which you asked again here). Look in the comments section for that reply. What attire do non-Igbo grooms wear during each stage of the Igbo traditional marriage? Hi Florence, there’s no rule, but usually, non-igbos wear their own people’s traditional attire OR the Igbo traditional attire. The choice is the bride’s and groom’s. Read the comments section for more answers to similar questions from other readers. Thanks. Plz dear who takes up d food expenses for d traditional wedding..d groom or the bride’s family?.. tnkx. Hi Solanz, these days, most couples are the ones paying entire bills for the wedding. What we see today is, usually, the groom or with his bride takes up the food bill. There used to be a traditional way of sharing bills but in most parts of the country, that does not usually hold anymore. >However, if your parents and/ or your wife’s parents are wealthy, they could, OF THEIR OWN WILL, DECIDE TO SUPPORT YOU WITH THE WEDDING CATERING (food and drinks) BILL, not for the bride and groom to impose it on them. Today, it depends on what part of Nigeria you are from, and what the tradition/ customs dictate there – for example, some Yorubas still do it. Some families have a tradition of collectively taking care of wedding food and drinks. So, only you how fat is your and your bride’s parents pockets. Although some parents still foot the wedding bills, not all the bills; but some part – only whereby the parents are wealthy. It used to be parents all-the-time paying for their children’s weddings in the olden days, because people married early and some do before they start working or making money. pls can you explained to me how payment of dowry is been made among the Igbo & if there is any definite amount. Igbo bride price varies slightly from village to village, but generally has a specific amount. However, the bride price amount is only a small fraction of the Igbo traditional marriage list and rite. By the way, they are not as scary or as expensive as non-Igbos portray it. – To see an example of what an Igbo marriage list is, read this (click). >>To get a good idea of the Igbo customary wedding stages and pre-wedding activities, right from Introduction and even before, read this (click). The only way to know your bride’s dowry amount is to ASK your inlaws, during your preliminary and introductory visits – they are always happy to tell. Hello Adaora, welcome to NaijaGlamWedding blog. How much you’ll spend on your wedding will largely depend on the number of guests you invite – food and drinks would consume over half of your budget. – So, start by setting aside the number of people you would like to have around. – You’ll have to do some market survey/ pricing of things from vendors, so as to get current prices to work with. – Catering Budget: Then calculate how much your feeding and drinks would cost for that number of people (ask caterers how much they would charge per plate/ guest for the food you plan to feed them, add average cost of drinks per person; AND finally multiply that by total number of guests you are looking at). – Venue/ Hall Budget: Go around and price venues, and then narrow on top 3 that are within your like and affordability range. Add this price to the catering budget you calculated. – Your outfits: Again, it’s only by pricing/ window shopping to get idea of current price. – Extra Money incase something comes up (add some loose cash, just in case). Add up all the prices, and you’ll have your wedding budget. NOTE: If the amount is too much, reduce the number of guests you plan on inviting, and re-calculate food and drinks cost, and then find a smaller venue (which should cost less) – that way, you can quickly and realistically get a budget close to the amount of money you and your fiancé have on hand. We have a lot of posts here on wedding budget calculation steps and tips for reducing wedding costs. Hi Jane. Yes, If the extended family agrees. It’s better to ask them first, as some people find it offensive/ degrading when a groom brings money to them instead of the LIST ITEMS. Just ask first. I’ll be looking forward to when you send us your wedding photos for features. plz I need to know how igbos do their traditional marriage in the olden days. I just want to know what were involved the type of foods, clothes, hair do, and do they actually involved in flattening room once etc. Hi Chichi, I don’t know much about the historic Igbo marriage culture and customs. Anyway, I found some information on that for you at Wikipedia (click here) and Igbo Guide website (click here). I hope that helps you. -Do you mean where to find pictures of Igbo attire styles or where to buy or rent? -For makeup our list of artists in Abuja, Imo and everywhere else in Nigeria, check our Vendors list (click here). ALSO, you may come to NaijaGlamWedding’s Facebook group (click here) for wedding vendors and ask for bridal makeup artists – and see replies from the MUAs on our group. Am a single yoruba man, intending to get married to an igbo girl, 4rm enugun state, dis post has really helped me a lot 2 understand what ibo marriage is all about, kudos 2 who rite dis up. Hi Kola, I am glad to be of help – most non-Igbo people are of the perception that the igbo engagement list marriage ceremony are beyond affordable (which is wrong). Thank you very much for your candid feedback comments like yours ‘gingers’ me and my team to fire up more helpful DIY wedding planning tips. Welcome to NaijaGlamWedding.com blog, be sure to read more wedding planning tips for Nigerian grooms here (click).